Palestinians run for cover from tears gas at the Israel-Gaza border, Gaza Strip, April 6. 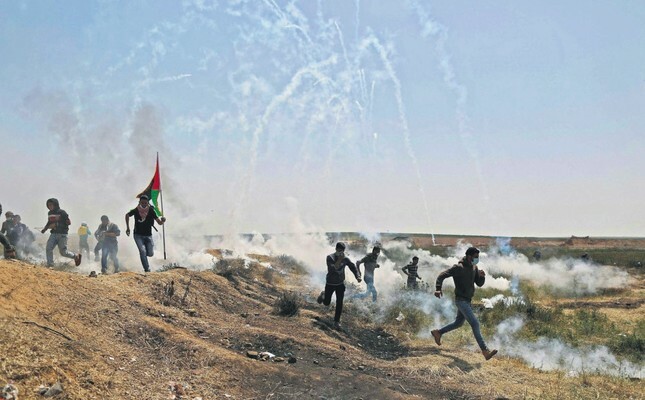 Israeli violence has broken out once again at the Gaza border as the Great Return March protests enter the second week with at least two Palestinians shot dead and around 250 others were wounded by Israeli forces. At least 23 Palestinians have died since the demonstrations near the heavily guarded Gaza border fence began on March 30. At least five of Friday's 40 wounded were in critical condition, according to the Gaza health ministry. Israeli forces have used internationally banned weapons against unarmed demonstrators near the border between Gaza and Israel, a Palestinian rights group said Thursday. "We have received information indicating the use of internationally-prohibited weapons by occupation forces, including exploding bullets, with the aim of causing the greatest number of injuries," Essam Younis, head of the Independent Commission for Human Rights, said at a press conference, as reported by Anadolu Agency (AA). According to Younis, the Israeli army "has deliberately killed civilians by targeting them directly, as evidenced by numerous injuries to the upper part of the body, specifically the head, neck and chest." He went on to urge international rights organizations to shoulder their legal and humanitarian responsibilities and work towards preventing Israel's ongoing violations against Palestinian civilians. The demonstrators are pressing for a right of return to what is now Israel for refugees - and their descendants - from the 1948 war surrounding the country's creation. Refugees comprise most of the 2 million-strong population of Israeli-blockaded Gaza, which is ruled by Hamas, the Palestinian resistance group. Hamas spokesman Hazem Qassem urged protesters to keep rallies peaceful. "Maintaining the peaceful nature of the protests will strike all fragile Zionist propaganda," he said, as reported by Reuters.The U.N. human rights office says it has indications that Israeli forces used "excessive force" during a deadly crackdown on protesters last week in Gaza and is expressing concerns about possible further violence. Spokeswoman Elizabeth Throssell noted on Friday that Israeli forces are required under international human rights law to use nonviolent means "to the extent possible," the Associated Press (AP) reported. Israeli forces opened fire on rallies marking "Land Day," an annual Palestinian commemoration of the deaths of six Arab Israeli citizens killed by Israeli forces in 1976, during demonstrations against government land confiscations in northern Israel. The protest is scheduled to culminate on May 15 when Palestinians mark the "Nakba" or "Catastrophe" when hundreds of thousands fled or were driven out of their homes in 1948 when the state of Israel was created. Israel has long ruled out any right of return, fearing it would lose its Jewish majority. It will also coincide with the U.S. Embassy's planned move on May 14 from Tel Aviv to Jerusalem, which has inflamed tensions. Israel withdrew from Gaza in 2005, but citing security concerns, still tightly controls its land and sea borders. Egypt also keeps its Gaza frontier largely shut.